Our featured painting by Diego Rivera is The Flower Carrier. Notice the bold, bright colors he uses. With the use of shadows he makes the subject stand out from the background of the painting almost as if the figures are outlined. How does he repeat the colors? Compare the size of the man to the size of the woman. 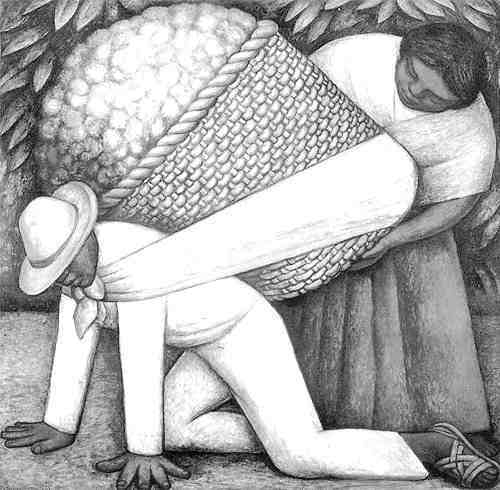 The man is carrying the heavy load, but he appears to be a smaller person than the woman putting the load on his back. Diego Rivera ( de A go rih VEH rə) was born in Guanajuato, Mexico in 1886. He had a twin brother, but his brother died when he was only a year and a half old. His mother became depressed and sent little Diego to live with his nurse Antonia, an Indian woman. She cared for him in a small village high up on the mountain. When he was six years old Diego's family moved to Mexico City. Diego loved to draw and his father made a studio for him by covering the walls with black canvas on which he could draw with chalk. He loved drawing soldiers, but he was not destined to be a soldier. He was sent to military school at age 10, but only stayed for a short time. He enrolled in evening art classes at the San Carlos Academy of Fine Arts in Mexico City. He studied there for five years, but was later expelled for participating in student revolts at the school. These experiences were only the beginning of the controversy which would surround Rivera throughout his life. At age 16 he left and started his career as a painter. The wall in front of Diego Rivera's home in Acapulco, Mexico is decorated with mosaics in bright colors. When he went to Paris in 1909 he saw Cezanne's work for the first time. He spent hours gazing at the artist's works. Later he went to Spain where he was awarded a four year scholarship to study art in Europe. He made various trips to France, Belgium, Holland, and Great Britian until finally settling in Paris in 1911. In 1913 he became a Cubist painter in order to support himself. He married Angelina, a Russian artist he met in London. During World War I money was scarce and they barely made a living. They had a son, but he died when he was very young and the couple separated. In 1922 he married Lupe Marín and they had two daughters. He and Lupe joined the Communist party. Five years later they divorced. Frida Kahlo was a young artist in Mexico. She was seriously injured in a bus accident and spent months in recovery. She met Diego and they married. It was a stormy relationship. They divorced and then remarried. Shortly before her death her art was exhibited in Mexico City. The doctor told her not to leave her bed, so she had the bed, with her in it, delivered to the exhibition. As a Communist, Rivera did not favor Stalin, but did help Trotsky who had broken with Stalin. Rivera gave him political asylum in Mexico in their home. After a quarrel with Diego, Trotsky and his wife moved out and he was assassinated by the secret police. Rivera became interested in the works of the Renaissance artists. The frescoes were especially appealing to him. A fresco is made by brushing watercolor on fresh wet plaster. He decided he could do this kind of art and it would be available to everyone. 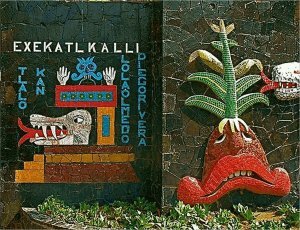 The Mexican ruler wanted murals to decorate the walls of the schools. Rivera was one of three artists chosen to paint these murals. He became director of the Academy of San Carlos in 1929. He is noted for the murals he painted on the walls of buildings. He was invited to paint murals in the United States. 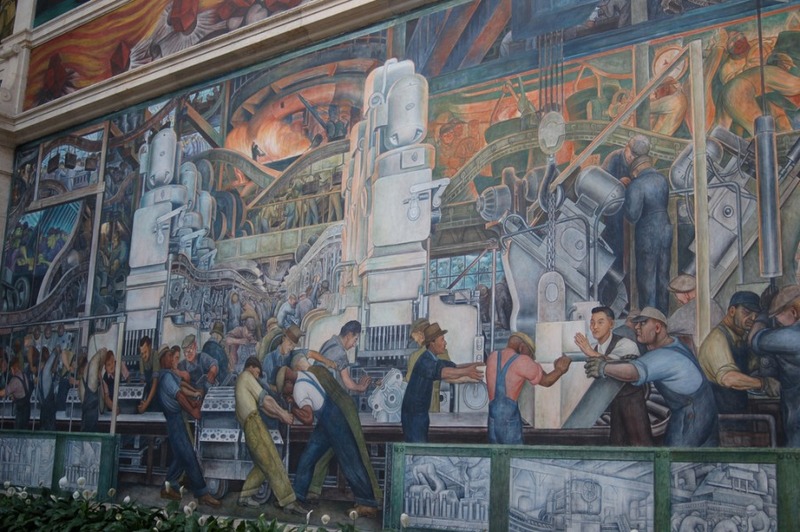 He painted one in California and then went to Detroit where in 1932 and 1933 he painted scenes from a Ford Motor plant. 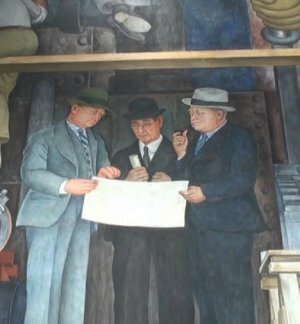 Edsel Ford agreed to pay him $21,000 for the mural. That was a lot of money, but he had to pay his assistants out of the fee. Industry workers at that time were making $22 a week. Before he started the work he toured the plants and watched them make cars for three months. After it was finished 20,000 people a day visited the museum to look at it. Rivera was a large man, over 6 feet tall and he weighed about 300 pounds. People didn't soon forget such an imposing figure. However, painting the frescos was grueling work and he lost 100 pounds. Frida did not even recognize him when he met her at the train station. 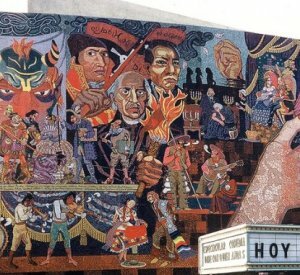 Because of his political views, some of his murals were not accepted by the people. When he proposed a large mural, Man at the Crossroads in New York, he thought his friendship with the Rockefeller family would allow him to put in the scene anything he desired, including a picture of Lenin, Communist leader in Russia. 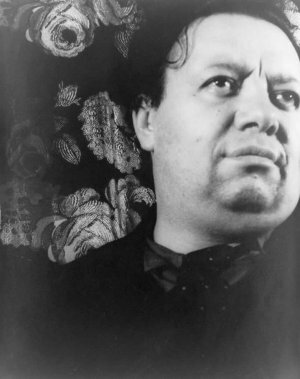 Nelson Rockefeller asked him to replace the picture of Lenin with another face, but Diego refused. He offered to put a picture of Lincoln on the other side of the mural, but that offer was refused by the art institute. They paid him in full for the work and told him to stop painting. 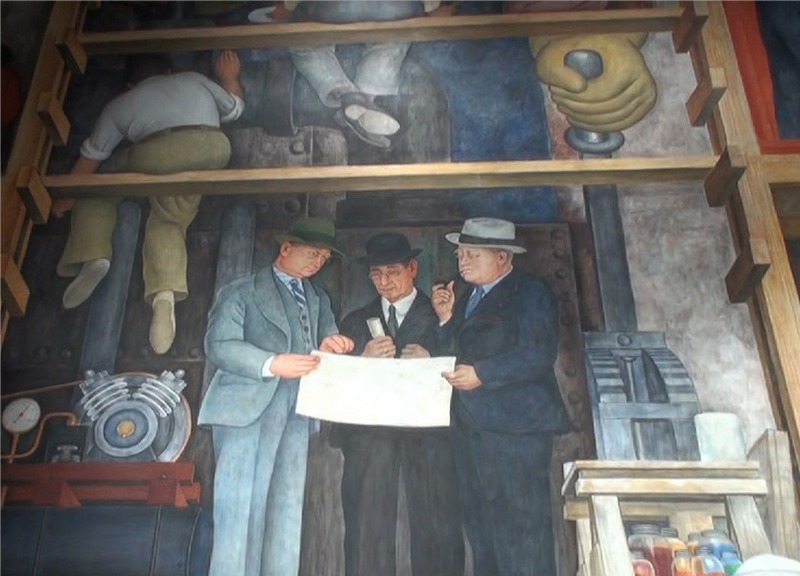 When Rockefeller stopped the work on the mural, Rivera and his assistants were escorted from the building and the mural was covered with a giant canvas. Later they went in a midnight one night and destroyed the mural with axes. 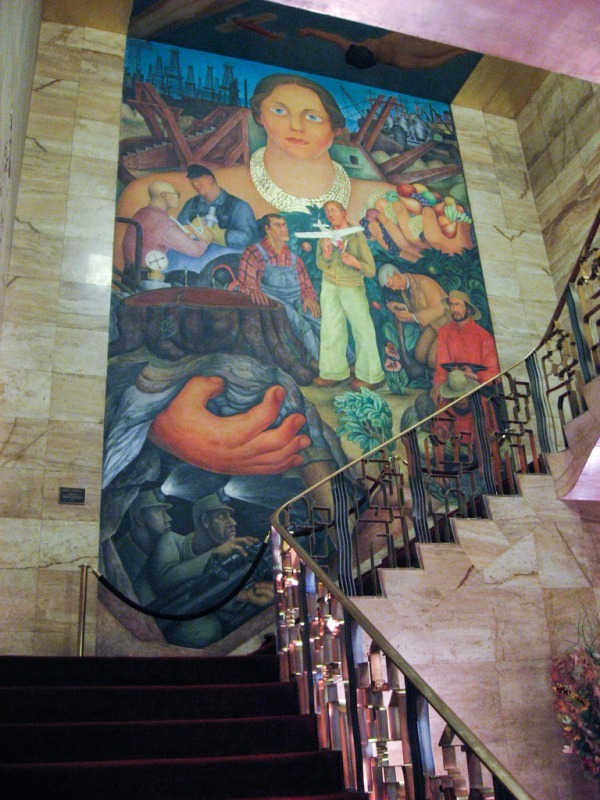 Rivera later painted a smaller version of the same mural in Mexico City. 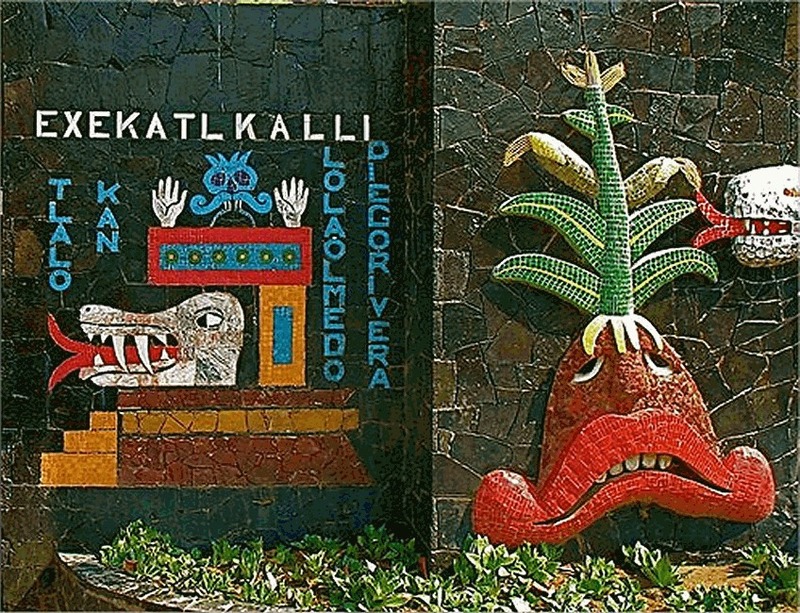 Fourteen years later he painted another controversial mural in Mexico for the Hotel del Prado. He included in it words denying the existence of God. Because of the scandal that occurred, the public was not allowed to view it for nine years. Four years after that incident he made a mural in Mexico in which he painted Stalin accompanied by Mao Tse-tung (MAH oh dZEH DOONG), Chinese Communist leader. Officials removed it from the building. 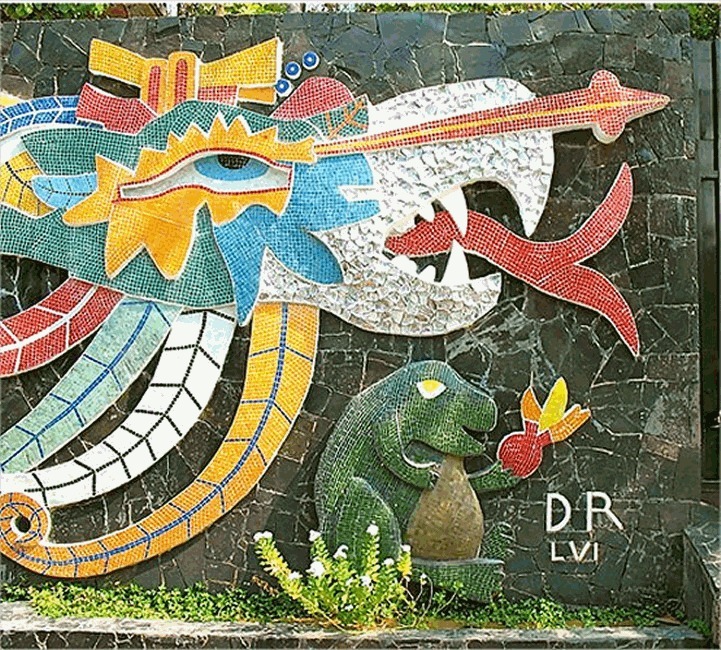 Rivera was a member of the Communist party the last thirty years of his life, but his insistence on promoting his political views did not set well with the people of Mexico and the United States who commissioned him to paint murals for them. 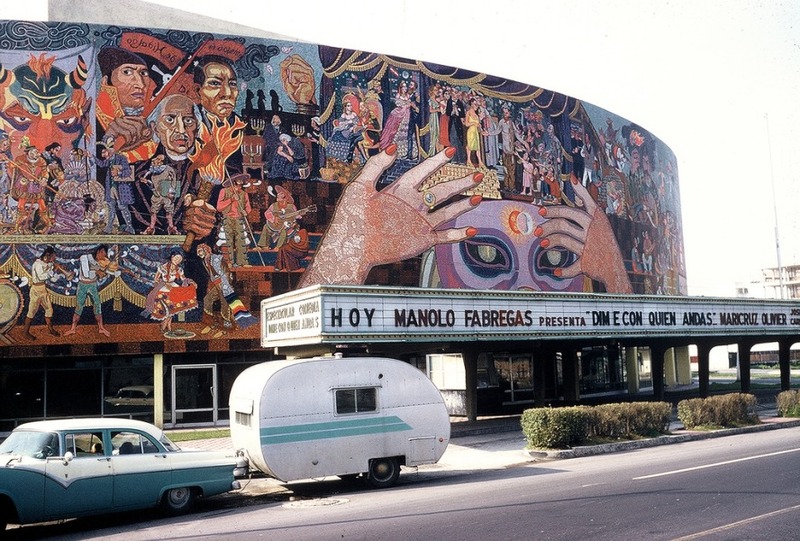 The mural shown below is on a Mexico theater. After Frida's death he married Emma Hurtado, who was his art dealer. He suffered with cancer, then had a stroke. His right arm became paralyzed and he continued to paint with his left hand. He died of heart failure in 1957 at the age of seventy-one. Foard, Sheila Woo. Diego Rivera, Philadelphia: Chelsea House, 2003. 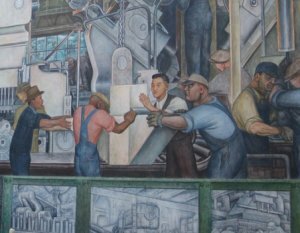 Press "Go" to search for books about Murals. This page displayed 389,106 times.